We’d love your help. Let us know what’s wrong with this preview of Best of All Possible Worlds by Gary Anderson. To ask other readers questions about Best of All Possible Worlds, please sign up. When offered a chance to read Gary Anderson’s Best of All Possible Worlds, I’ll admit to having some cautious skepticism, something along the lines of: Tell me more (actually, exactly along that line). After checking out the synopsis, I realized that to do the book and the author any justice, it was going to require my rereading Candide—something I wasn’t exactly excited about doing. I accepted the opportunity and set about contriving excuses for my inevitable disappointment. I dutifully reread Candide. What’s this? It wasn’t nearly what I remembered. In fact, I rather liked it. The Candide of my youth, wasn’t the Candide of my adulthood. It’s satire, sarcasm, and religious skepticism spoke to me in ways that my more youthful reading couldn’t appreciate. Good for me, but…I still had BoAPW to read, and it’s larger, the text is more densely packed, it’s going to require more effort, more thought. You can do this, I cautiously convinced myself. Not exactly the best way to begin a book, but we’re readers, we always hope for the best. So I got started, reluctant, somewhat cynical, and then…then…I couldn’t stop reading. I was caught up. Immediately. Anderson had taken an incidental character from Candide and created this incredible world for him to inhabit—and all just to entertain me. (Not exactly, of course, but it felt that way.) Jacques the Anabaptist, now Jakob the Anabaptist, has his own rich story to tell—the story of his Dutch family (seafaring Father, cynical Mother, evil Brother, and vision-inducing Grandmother [his oma with her ‘incredible aars] ), his great love, not to be confused with his fiancée, plus a village full of other characters—including Pangloss and Candide—in the humorous spirit of Candide, with their own personalities, foibles, religious intolerances and superstitions, through journal entries, letters, straightforward narrative, and as a bonus, especially if you’ve read one of the footnoted classic editions of Candide, scores of footnotes that mimic those classic editions. Told at a furious pace, with bawdiness and biting, biting humor. A grand, great time worthy of yours. While this novel expands up Candide, it is in no means a prerequisite to enjoying Anderson’s undertaking. The novel functions well on it’s own merits and is entirely self contained, which allows both new readers and those familiar with Voltaire to be satisfied on this adventure. And what an adventure it is. The pace never slackens as it sails through primitive uprisings, high seas combat, pseudo-religious buffoonery, cloak-and-dagger betrayal and a wide assortment of shady undertakings. The world is painted as unfriendly and savage with violence and bitter death rearing it’s head at any and all moments. The instantaneous violence that springs up put me in the mindset of those bleak worlds crafted by Cormac McCarthy, for here too we see the that just because you have the power to doesn’t make it right to exercise your might over another’s life. For those versed in the worlds of Voltaire, however, will find a well-crafted homage to his humor and many nods to his stylistic choices. Flowing through the novel is the omnipresent problem of evil in the world. To exemplify this, Anderson sets out creating an overarching duality to the novel. We have the brothers Jacob and Robrecht, the former having left the turmoil of sea life in order to seek stability on land while the latter whom ‘wherever he went, death was there also’. We have one soul set on stability while another exists simply to rock the boat. It seems it would be hard to find such stability, when attempts at finding peace with God lead Jacob into the folds of a misguided flock with visions of a Holy aars and his way is continuously beset by evil. Evil however, seems to flourish and pave the way to glory for those who are not incinerated by it’s touch. In a sense, evil is seen as the natural course in a supposedly perfect world. This duality extends beyond the basics of good and evil. Through the frequent footnotes, the reader is often faced with two simultaneous stories and it often is employed to show how the events of the past and present intertwine. The flawed souls of the novel ‘loped lopsidedly into the future, destined to pay for the mistakes of its youth’. The letters and journal entries which are dispersed between each chapter serve a similar purpose as well as give insight into the actions of a character. The intertwining is used as well in the uproarious baptism scene for great effect. As the rites and rituals occur, the text fluctuates between the action at hand and snippets of prayer, showing a dual world of mortal flesh and immortal holiness as the bonds of religious fervor attempt to coil around the Jacob’s fate. The crude humor in the religious scenes create a wonderful juxtaposition of man and God as well – while they preach purity and holiness, man is shown as vile, base, and riddled with sin. For those with a taste for adventure and bawdy humor, Anderson’s The Best of All Possible Worlds is an excellent choice. The dedication to Voltaire’s style shines through in a work that is highly humorous and satirical in it’s own right. I now have higher hopes for the modern world of novelists. Review copy kindly provided by author and GR friend, Gary Anderson. Anabaptist who aids them; here he is given the name Jakob Onderdonk. It also follows the fortunes of his brother, polar opposite and nemesis, Robrecht. As a literary creation, this book is quite dazzling. The world created is convincing, painted in m Review copy kindly provided by author and GR friend, Gary Anderson. As a literary creation, this book is quite dazzling. The world created is convincing, painted in minute detail and populated with (would-be) saints and sinners, paragons and perverts, heroes and whores. True to the spirit of Voltaire, Anderson serves up social satire so sharp that it is enough to make the reader wince even while (s)he laughs. For we see rottenness in many forms, seething beneath the veneer of polite society, rearing its head openly at sea, and running rampant in the Dutch colonies. Moreover, like Voltaire's original, this is a satire of philosophy; it presents odd characters and bizarre situations, and then explains, often in detailed footnotes, the various chains of cause and effect which have produced the spectacles the reader now views. The polish is marred somewhat by typos and syntax errors which might have been caught by better proofreading. Anderson's use of Dutch, while surprisingly good, could have been excellent with a few adjustments. I know from personal experience how difficult it is to make use in one's writing of a language which is not one's mother tongue, so I don't want to be too harsh here. These flaws are overall fairly minor. The aspect of the book that bothered me the most was the satire of the religious sects in the Netherlands, especially the Anabaptists. During the time in which the story was set, they were considered radicals and were ridiculed and persecuted as such by Catholics and Protestants alike. To be fair to Anderson, all of his religious groups come in for a drubbing, which has a kind of leveling effect; the overall message is a critique of sectarianism. But the "abomination of desolation...(let the reader understand)" erected by his befuddled Anabaptists is so outrageous that it strains even my tolerance. “Best of All Possible Worlds" is a literary tour de force of real genius. The narrative voice is one of a kind: witty, shrewd, captivating, hilarious. Its satirical quality as well as the sheer power of the narrative style rival Voltaire in "Candide." Anderson’s brilliant imagination for his story line knows no bounds and signifies his indelible mark as a story teller. This ambitious epic genuinely is the best of all possible literary novels – read this masterpiece. I thought that I would write to the author, for whom I have a high regard, a different review of his book than the one that I offer here. I then thought, if there were a difference in praise or disapproval, that would be tantamount to frank intellectual dishonesty. So, for better or worse, here are my thoughts to everyone. Firstly, I liked this book because it is of the ilk that I almost always appreciate. I love irony, satire and even sarcasm. I read Candide in preparation for reading BoAPW. I I thought that I would write to the author, for whom I have a high regard, a different review of his book than the one that I offer here. I then thought, if there were a difference in praise or disapproval, that would be tantamount to frank intellectual dishonesty. So, for better or worse, here are my thoughts to everyone. Firstly, I liked this book because it is of the ilk that I almost always appreciate. I love irony, satire and even sarcasm. I read Candide in preparation for reading BoAPW. I enjoyed and will recommend the former much more than after my first read of it decades ago. The great books are like that. For some reason I thought that I had read somewhere that BoAPW was unique and not a derivative work. I do not think that there is any question; this book is derivative in nature. I am an avid listener of books. I listen to about 100 of them (many approaching 1000 pages) per year. I love literature, especially great literature and believe Gary’s might just be up there with some of the greats. Though perhaps it is because I listen to so many books and read so few literary works that I struggled with this one. There are not only many French words but whole expressions within the works of Dumas but he is one of my all-time favorite authors. Throughout the BoAPW there were many non-English words that I did not know and, while many times I could glean their meaning from within the context of the narrative, I sometimes struggled. While mine did not contain them, my understanding is that at least one of the editions of Voltaire’s work was fraught with footnotes. Apparently Gary Anderson chose to do the same in the spirit of Candide. The footnotes drove me crazy. For me they were tics and it made the book ponderous. As I said to a friend, I am loathe to use that adjective because it connotes clumsy and for others of greater reading ability than I, this might not be the case. Between the non-English words and these dang footnotes, I got cognitive indigestion. I too often lost my focus of the narrative. There is a great deal of BoAPW to recommend. The narrative itself is really quite simple and not at all “ponderous.” It is funny and enjoyable. That it is a derivative work is nothing to be ashamed of but, I believe, one that holds it to a higher standard since one cannot help but relate and compare the derivative with the original source material. Voltaire will always be lurking out there in the shadows... watching. While reading this book, the descriptor “scholarly-written” kept popping up in my mind. Does that equate with literary work? I don’t know. That too must be left to be decided by those much more qualified than I. But for me, it certainly felt that way. The narrative was well-crafted and felt masterful. When I stopped reading and paying so close attention to those god-damned footnotes, it felt like I was reading a classic. And, to totally blaspheme, (because I cannot even allow the name to come out) the original source material began to seem almost sophomoric. Reminiscent of John Barth’s Sotweed Factor – and equally accomplished, Gary Anderson’s Best of All Possible Worlds is a sustained comic delight. Masterful, outrageous, teeming with exotic incidents and characters, Anderson’s novel is a richly inventive elaboration of a small detail in Voltaire’s Candide. Candide’s chance encounter with a charitable Anabaptist blossoms, in Anderson’s novel, into the story of the pious Jakob Onderdonk and his family of 18th-century Dutch eccentrics. The two main Reminiscent of John Barth’s Sotweed Factor – and equally accomplished, Gary Anderson’s Best of All Possible Worlds is a sustained comic delight. Masterful, outrageous, teeming with exotic incidents and characters, Anderson’s novel is a richly inventive elaboration of a small detail in Voltaire’s Candide. Candide’s chance encounter with a charitable Anabaptist blossoms, in Anderson’s novel, into the story of the pious Jakob Onderdonk and his family of 18th-century Dutch eccentrics. The two main characters are the good-hearted Jakob and his evil brother Robrecht, whose interweaving narratives establish a counterpoint between an ineffectual idealism and an extravagantly depraved pragmatism. The memorable supporting cast includes their addled grandmother (whose farts bring about a preacher’s visions) and the deliciously hideous and murderous Able Seaman Dag (whose favorite sexual partners are a goat, a hen and an ostrich). The filth and murk of opium dens, whores of various races, a slave-trader with a taste for buggery, a sailor thrown overboard and eaten alive by sea creatures: such violent, bawdy and often deranged details grace every page of this astonishingly fine novel. Don’t miss it. Best Of All Possible Worlds is a unique delight to read. Written as a sort of sequel to “Candide,” Anderson recreates Voltaire’s narrative style, but with a conceptualist’s eye. He takes a small fragment from Candide and builds a rich story upon it that is full of comedic turns of phrase and an absurdity reminiscent of Alfred Jarry’s “Ubu Roi." 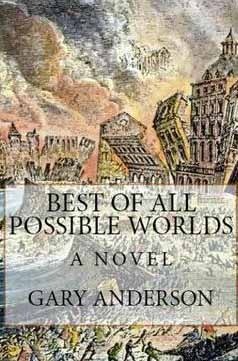 I continue to be impressed with Gary Anderson’s literary genius and I highly recommend Best Of All Possible Worlds to anyone looking for a critical and fr Best Of All Possible Worlds is a unique delight to read. Written as a sort of sequel to “Candide,” Anderson recreates Voltaire’s narrative style, but with a conceptualist’s eye. He takes a small fragment from Candide and builds a rich story upon it that is full of comedic turns of phrase and an absurdity reminiscent of Alfred Jarry’s “Ubu Roi."